BD 14 x 24, TT 8 x 12, TT 9 x 13, FT 16 x 16 and 5.5 x 14 Powertone COB snaredrum. Nice original condition. 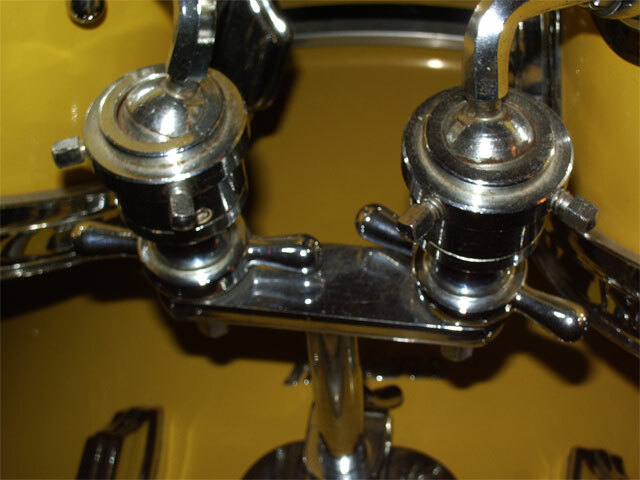 Since the introduction of the Rogers beavertail lugs in 1964, Rogers were Cadillac of the drums. 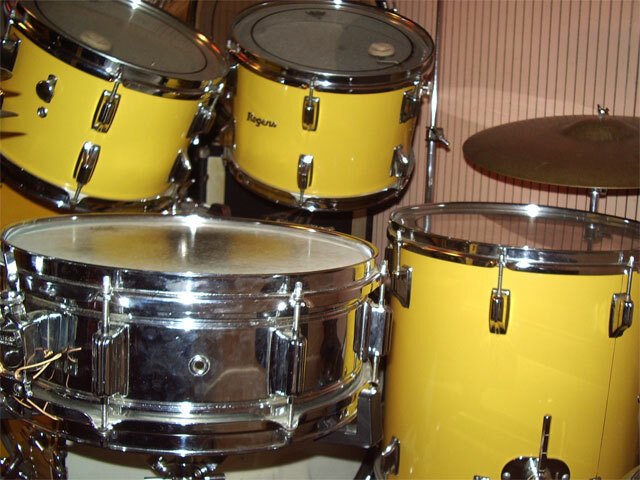 With modern SwivoMatic hardware and perfect shells and hoops they were far ahead of Slingerland and Ludwig who were still using their pre-war tradition and tooling. Rogers was the most expensive too. 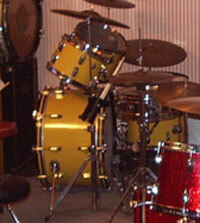 This is a 1972 Fullerton set, one of the first in Spanish Gold finish. The chrome has a little pitting and the wrap has some scratches on the bassdrum where the toms hang, but overal this is a really clean complete and original set with a big sound, the 5ply maple shells have 5ply reinforcement hoops. 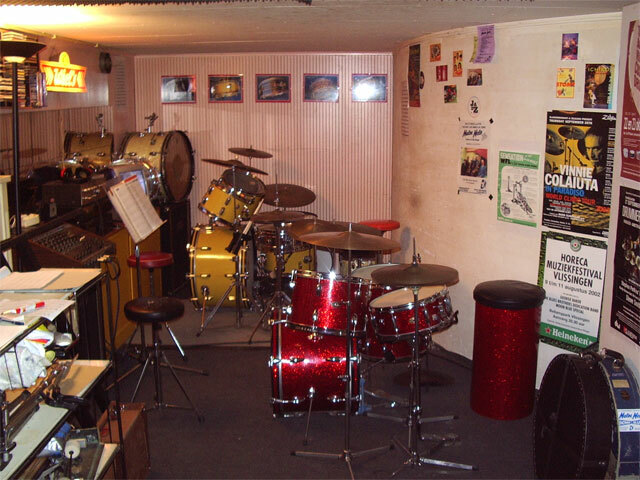 -all hardware to set up the drums, tomholders and legs. The Powertone snare drum has a chrome over brass shell, very sensitive and still warm when needed loud! Apart from some fingerprints a very clean and original snaredrum. 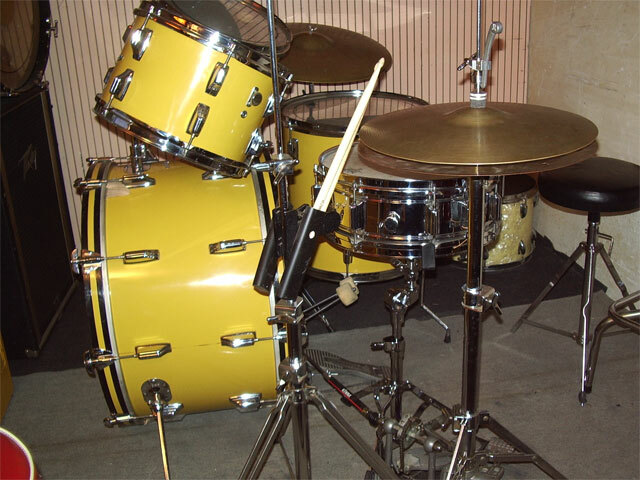 Rogers Spanish Gold set and Slingerland Red Sparkle in Winnie's Drumkit drumstudio.